Background and objectives: Higher phosphorus levels are associated with cardiovascular disease (CVD) events and mortality. Whether vascular stiffness may be responsible is unknown. Design, setting, participants, & measurements: This study examined the cross-sectional associations of serum phosphorus with ankle brachial index (ABI), pulse pressure, and large and small artery elasticity by radial artery waveform analysis among 1370 individuals (440 with moderate chronic kidney disease) who did not have clinical CVD and participated in the Multi-Ethnic Study of Atherosclerosis. Results: Fifty-nine (4%) individuals had high ABI (>1.30), a marker of peripheral arterial stiffness. Participants with phosphorus levels >4 mg/dl had greater than four-fold risk for high ABI compared with participants with phosphate levels <3 mg/dl (relative risk 4.6; 95% confidence interval 1.6 to 13.2; P = 0.01) after adjustment for demographics, traditional CVD risk factors, and kidney function. Higher phosphorus levels were also associated with greater pulse pressure and lesser large and small artery elasticity in unadjusted models, but these associations were attenuated after adjustment. Conclusions: Higher phosphorus levels are strongly associated with high ABI but not pulse pressure or large or small artery elasticity. If confirmed in future studies, then the association of higher phosphorus concentrations with CVD events may be partially mediated through peripheral arterial stiffness. Studies have demonstrated that higher serum phosphorus concentrations are associated with increased risk for cardiovascular disease (CVD) events, even among individuals without kidney disease and with phosphorus concentrations squarely within the normal laboratory range (1,2). The responsible mechanisms are unknown. Vascular calcification and associated alterations in vascular stiffness represent an attractive hypothesized mechanism to link phosphorus with CVD. In vitro studies demonstrated that exogenous phosphorus induced phenotypic transformation of human aortic vascular smooth muscle cells to osteoblast-like cells, characterized by upregulation of key osteoblast transcription factors, production of calcium-binding proteins, and secretion of matrix vesicles that subsequently facilitate calcium deposition in the extracellular space (3). These vascular smooth muscle cells carry a sodium phosphorus co-transporter, PIT-1, that is both necessary and sufficient for calcification (4,5). We recently found higher serum phosphorus concentrations to be strongly and linearly associated with calcification of the coronary arteries, descending thoracic aorta, and mitral annulus, independent of traditional CVD risk factors and other measures of mineral metabolism among Multi-Ethnic Study of Atherosclerosis (MESA) participants with moderate chronic kidney disease (CKD) (6). Associations were evident even at phosphorus concentrations within the normal laboratory range. Whether higher serum phosphorus concentrations are associated with functional vascular stiffness and whether such associations also might extend to individuals without CKD is unknown. We hypothesized that higher serum phosphorus concentrations would be associated with increased vascular stiffness among individuals with or without CKD. To that end, we evaluated the association of serum phosphorus concentrations with four measures of vascular stiffness: High ankle brachial index (ABI), pulse pressure, and large and small artery elasticity among participants in MESA, a community-based observational study of individuals without clinically apparent CVD. MESA was designed to investigate the prevalence and progression of subclinical CVD. Details about the study design have been published previously (7). In brief, between July 2000 and August 2002, 6814 men and women who were aged 45 to 84 yr; identified themselves as white, black, Hispanic, or Chinese; and were free of clinically apparent CVD were recruited from six US communities: Baltimore, MD; Chicago, IL; Forsyth County, NC; Los Angeles, CA; Northern Manhattan and the Bronx, NY; and St. Paul, MN. The institutional review boards at each participating center approved the study, and participants provided written informed consent. All participants underwent a day-long study visit at which they provided medical and dietary history, venous blood specimens after an overnight (8 h) fast, and spot urine specimens and underwent physical examination including BP, ABI measurement, and arterial waveform analysis. For this ancillary study, we selected all participants (n = 641) with an estimated GFR (eGFR) <60 ml/min per 1.73 m2 and randomly selected 1000 participants from the remainder of the cohort with higher eGFR. This sampling scheme was designed to maximize the range of kidney function in the study sample. Participants with a reported history of cancer (n = 168), which may alter calcium-phosphorus metabolism, and those with inadequate stored serum volume to perform the ancillary phosphorus measurements were excluded (n = 103), resulting in a 1370-participant study sample for this analysis. Phosphorus concentrations were measured in morning serum specimens after an overnight (8 h) fast using a Vitros 950 IRC instrument by reflectance spectrophotometry at the Laboratory for Clinical Biochemistry Research at the University of Vermont. Analytic coefficients of variation were <5%. After the participants rested supine for 5 min, systolic BP (SBP) was measured in both arms. For each leg, the SBP in the posterior tibial and dorsalis pedis artery was measured using continuous-wave Doppler ultrasound probes. The leg-specific ABI was calculated as the higher SBP in the posterior tibial or dorsalis pedis divided by the higher of the two-arm SBPs. The highest arm SBP was used because of the strong association between peripheral arterial disease and subclavian artery stenosis (8). Participant-specific ABIs were defined by the lower of their two leg-specific ABI measurements. When leg BP could not be abolished with the cuff inflated to >300 mmHg, individuals were deemed incompressible. Resting BP was measured three times with participants in the seated position with a Dinamap model Pro 100 automated oscillometric sphygmomanometer (Critikon, General Electric, Madison, WI). The average of the last two measurements was used in analyses. Pulse pressure was calculated as the difference between the SBP and diastolic BP. Large and Small Artery Elasticity. Large and small artery elasticity indices were measured by the HDI PulseWave CR-2000 Research CardioVascular Profiling Instrument. While the participants were supine, the pulse pressure sensor was positioned over the right radial artery, supported by a wrist stabilizer, and measurements were taken for 30 s. A BP cuff was placed on the contralateral arm. Analysis of the diastolic decay waveform allowed evaluation of large and small artery elasticity. Specifically, the first peak of the recorded wave represents large arteries because it results from the expansion of the arteries after systole. The second peak is a rebound wave, which mainly represents the elasticity in the smaller arteries. A computer-based third-order Windkessel model was used to analyze the diastolic pulse contour and calculate an elasticity index for small and large arteries by incorporating age, heart rate, ejection time, weight, and height. These measures have been described in detail elsewhere and have been compared with invasive methods with high degrees of accuracy (9,10). Standardized questionnaires determined age, gender, race/ethnicity, and medical history. Diabetes was defined as a fasting glucose ≥126 mg/dl or use of hypoglycemic medications (11). Smoking history was categorized as ever versus never. Total and HDL cholesterol and triglyceride concentrations were measured from venous samples by standard methods, and LDL was calculated from the Friedewald equation (12). C-reactive protein (CRP) was measured using the BNII nephelometer (N High Sensitivity CRP; Dade Behring, Deerfield, IL). Serum creatinine was measured using a colorimetric method by a Kodak Ektachem 700 Analyzer (Eastman Kodak, Rochester, NY) and was standardized to the Cleveland Clinic Foundation reference standard using indirect calibration. Creatinine, age, gender, and race were used to calculate eGFR using the abbreviated Modification of Diet in Renal Disease (MDRD) formula (13). Dietary intake of calcium, phosphorus, protein, and fat was calculated from a 127-item Block-style food frequency and dietary supplement questionnaire. Serum phosphorus concentrations were evaluated in 0.5-mg/dl categories and as a continuous linear variable. Differences in demographics and clinical characteristics across phosphorus categories were evaluated using ANOVA or the Kruskal-Wallis test for continuous variables and the χ2 test or Fisher exact test for categorical variables, as appropriate. We categorized ABI values into three mutually exclusive categories: Low (<0.9), intermediate (0.9 to 1.3), and high (>1.3 or incompressible) (14). The associations of phosphorus and ABI categories were evaluated using multinomial logistic regression, with the intermediate ABI category serving as the reference group. This statistic can evaluate a multilevel outcome without assumptions of ordinal relationships and uses a log-link, so estimates are reported as relative risks. We evaluated pulse pressure and large and small artery elasticity as continuous variables, with log transformation of the elasticity variables as a result of skewed distributions. The associations of phosphorus concentrations with each of these continuous dependent variables were evaluated using linear regression. We calculated adjusted mean levels of each stiffness measure within phosphorus categories by multiplying the mean covariate values by their respective coefficients. Log-transformed outcomes were anti-logged to provide geometric means for clinical interpretability. Initial models were unadjusted. A second model adjusted for age, gender, and race. The final model adjusted for these demographics and all other variables associated with serum phosphorus levels in bivariate analysis with the exception of measured BP because this variable is used in the calculation of ABI and pulse pressure. Last, a multiplicative interaction term (phosphate [continuous] * moderate kidney disease [eGFR <60 versus ≥60]) was evaluated in each multivariable model to determine whether the association of phosphorus and each vascular stiffness measure was modified by CKD status. Because the algorithm to compute large and small artery elasticity includes variables that were also included in our adjusted models (age, height, and weight), we explored several sensitivity analyses to evaluate their potential influence on our adjusted estimates. First, we repeated multivariable analyses excluding age and body mass index as adjusting covariates. Second, the algorithm for the elasticity measurements uses these variables to estimate systemic vascular resistance (SVR). Estimated SVR is included in the denominator of the equation for large and small artery elasticity. Thus, we multiplied the elasticity measurements by the SVR estimate (large artery elasticity * SVR and small artery elasticity * SVR) to derive new variables that uniquely reflected change in the radial artery by ultrasound, independent of the effects of age, height, or weight, and the derived variables were evaluated as a dependent variable in sensitivity analyses. Results of these sensitivity analyses were similar to those reported here and are therefore not presented. All statistical analyses were conducted with Stata 9.2 for Windows (Stata Corp., College Station, TX). The mean age of the 1370 study participants was 64 ± 10 yr, and 55% were female. Thirty-nine percent were white, 27% were black, 20% were Hispanic, and 14% were Chinese. The mean serum phosphorus concentration was 3.5 ± 0.5 mg/dl, and mean eGFR was 71 ± 19 ml/min per 1.73 m2 (440 [32%] had eGFR <60 ml/min per 1.73 m2). Compared with participants with lower phosphorus concentrations, those with higher concentrations more likely female and more likely to have diabetes, and were less likely to have smoked (Table 1). SBP was similar across phosphorus groups, whereas higher phosphorus categories had lower diastolic BP. Higher phosphorus concentrations were also associated with higher LDL, HDL, triglyceride, and CRP levels and lower eGFR. Dietary intake of total calories, fat, calcium, and phosphorus did not differ significantly across phosphorus groups. 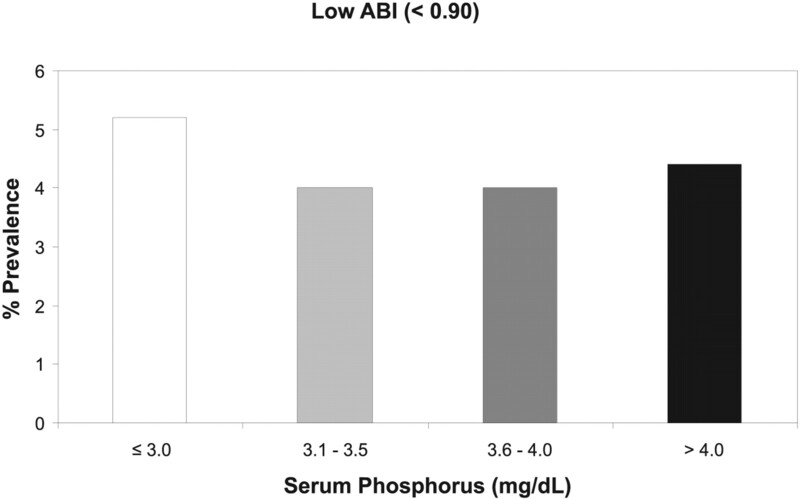 Participants with phosphorus concentrations >4 mg/dl had approximately twice the prevalence of high ABI compared with participants with lower phosphorus concentrations (Figure 1). In unadjusted models, participants with phosphorus concentrations >4 mg/dl were at significantly increased risk for high ABI compared with participants with phosphorus <3 mg/dl, the reference category (P = 0.05), whereas participants with intermediate phosphorus concentrations had risk similar to the reference category (Table 2). In models adjusted for age, gender, and race/ethnicity and in fully adjusted models, the nature of this association became monotonic and participants with phosphate levels >4 mg/dl remained at four-fold increased risk for high ABI compared with participants in the reference category. When evaluated as a continuous predictor variable, each 1-mg/dl increase in phosphorus concentrations was associated with approximately two-fold increased risk for high ABI in the fully adjusted model (relative risk 2.1; 95% confidence interval [CI] 1.2 to 4.0; P = 0.01). These associations were similar among participants with or without CKD (P = 0.88 for interaction). Prevalence of high ankle brachial index (ABI) by serum phosphorus concentrations in the Multi-Ethnic Study of Atherosclerosis (MESA). In contrast to high ABI, the prevalence of low ABI was similar across phosphorus categories (Figure 1⇓). No association was observed between phosphorus concentrations and low ABI in either unadjusted or fully adjusted analyses (Table 2). Prevalence of Low ankle brachial index (ABI) by serum phosphorus concentration in the Multi-Ethnic Study of Atherosclerosis. Higher serum phosphorus concentrations were also associated with higher pulse pressure and lower large and small artery elasticity in unadjusted analyses; however, each of these associations was attenuated and no longer statistically significant when adjusted for age, gender, and race/ethnicity and remained NS in the fully adjusted models (Table 3). When evaluated as a continuous predictor variable, phosphorus concentrations were also not significantly associated with any of these stiffness measures in the final multivariable models (P = 0.57, 0.34, and 0.32 for pulse pressure and large and small artery elasticity, respectively). The associations of phosphorus with each continuous measure of stiffness were similar among participants with and without moderate CKD (all NS). Our primary finding in this study is a strong and independent association of higher serum phosphorus concentrations with high ABI among individuals without clinically recognized CVD. 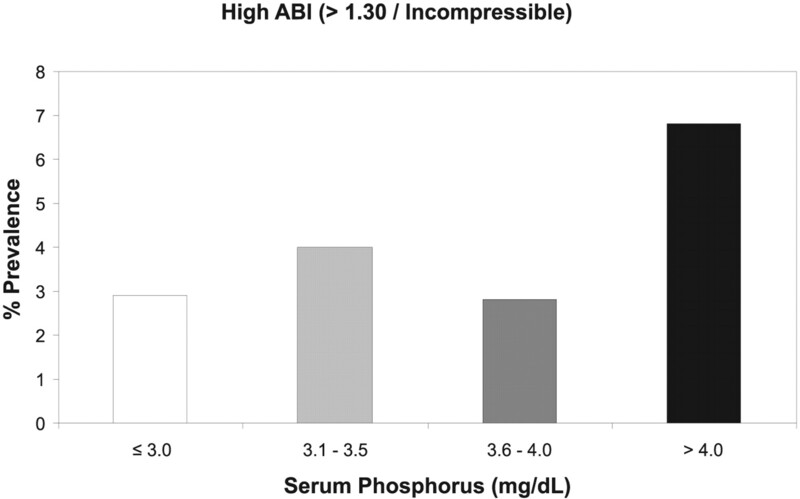 Higher serum phosphorus concentrations were not associated with low ABI, a sensitive and specific marker of lower extremity occlusive atherosclerosis (15). Although higher phosphorous concentrations were also associated with pulse pressure and large and small artery elasticity in unadjusted analyses, these associations were attenuated and not statistically significant in models adjusted for age, gender, and race/ethnicity. High ABI is an indicator of stiff lower extremity arteries, and a high ankle BP is a specific (albeit insensitive) marker for medial arterial calcification (MAC) (16). High ABI was associated with all-cause (17–19) and CVD mortality (17,19), stroke, and heart failure (17) in several large, community-based, observational studies. If the association of higher phosphorus concentrations and high ABI is confirmed in future studies, then the association of phosphorus and CVD events might ultimately be explained by lower limb arterial stiffness, potentially the consequence of MAC (1,2). Why were higher phosphorus concentrations associated with high ABI but not other measures of vascular stiffness? We hypothesize that phosphorus may be uniquely associated with MAC. Distinct from intimal atherosclerosis, MAC is limited to the tunica media and has a uniform distribution, resembling a ring in vessel cross-section, and tram-track pattern when viewed longitudinally (20). Its diffuse nature is believed to contribute directly to vascular stiffness (21,22). MAC preferentially affects distal lower extremity arteries (16,23) with highest prevalence in the ankles, lower in the calf and thigh, and the lowest in the hands (23). Although pulse pressure and large artery elasticity measure stiffness in arteries of similar caliber to those evaluated by ABI, their measurements were limited to the upper extremities, where MAC is less prevalent, thereby potentially explaining the discrepant associations observed in our study (16,23). Although high ankle BP has been demonstrated to be specific for MAC, our study did not include plain radiographs of the lower limbs to confirm the presence of MAC. Thus, other mechanisms that contribute to vascular stiffness, such as thinning and fraying of the elastic lamellae (24,25), deposition of collagen (26), and advanced glycation end-product deposition (27,28), remain possible determinants of lower limb arterial stiffness responsible for the associations observed here. Although not definitive, the hypothesis that higher serum phosphorus may be uniquely associated with MAC is supported by results of previous studies. Individuals with kidney disease and diabetes consistently have higher phosphorus concentrations, on average (1,2,29), and also consistently have high prevalence of MAC (21,23,30,31). In addition, higher phosphorus concentrations have been associated with MAC as determined by characteristic appearance on lower extremity plain x-rays among patients with ESRD (21); however, patients with ESRD frequently have high serum phosphorus concentrations and severe vascular disease. To our knowledge, no previous study has evaluated the associations of serum phosphorus concentrations with vascular stiffness or x-ray–determined MAC in populations without severe CKD. Future studies enriched with individuals with high ABI and with x-ray measurements of MAC are required to confirm the findings demonstrated here. We also considered whether measurement error may have contributed to discrepant findings between serum phosphorus levels and high ABI as compared with the other measures of arterial stiffness. Previous studies have reported that the interobserver reliability (expressed as the respective SD divided by the mean) of ABI measurements was 9% (32), clinic pulse pressure was 20% (33), and small and large artery elasticity were <4% (10), respectively. These data suggest that pulse pressure is the least reproducible, and, therefore, measurement error may have biased the association of phosphorus with pulse pressure toward the null hypothesis; however, it is unlikely that any true association would be greater than the bounds of the 95% CIs observed in this study (Table 3). Because these bounds were relatively narrow, any such relationship should be modest, at most. On the basis of existing literature, reliability is best for the large and small artery elasticity measurements; therefore, the null association of phosphorus with these measurements is unlikely to reflect measurement error in isolation and would not explain the discrepant association with high ABI. Strengths of this study include its community-based sample, diverse race/ethnicity, inclusion of individuals with and without CKD, availability of several measurements of vascular stiffness, and uniform measurement of a wide range of potential confounding variables. In addition, all phosphorus measurements were made in morning specimens after an overnight fast, reducing bias as a result of recent oral intake or diurnal variation. The study also has important limitations. First, only 51 (4%) participants had high ABI. Although the observed magnitude of association of phosphorus with high ABI was strong and highly statistically significant, these findings should be confirmed in future studies. Second, the cross-sectional design precludes distinction of whether higher serum phosphate concentrations led to vascular stiffness or arose from vascular stiffness. Next, our study population did not include participants with advanced CKD and may not generalize to this population. We did not have serum calcium or intact parathyroid hormone levels available, so were not able to evaluate the relationships of these measures with vascular stiffness. Pulse wave velocity measurements were not available in MESA, and future studies are required to evaluate the association of serum phosphorus levels with this measure of arterial stiffness. Last, despite narrow bounds of the 95% CI observed for the continuous vascular stiffness measures (Table 3), we cannot exclude the possibility that an association of phosphorus with these outcomes was missed as a result of chance. We observed a strong association of higher serum phosphorus concentrations with high ABI, independent of traditional CVD risk factors and kidney function in community-living individuals with normal to moderate CKD. In contrast, we observed no association between serum phosphorus concentrations and low ABI, pulse pressure. or large and small artery elasticity in adjusted analyses. If confirmed in future studies, then these observations support the hypothesis that circulating phosphorus concentrations may influence the development of medial arterial calcification in the lower extremities and thereby may partially account for associations of phosphorus with CVD events observed previously. This study was supported by an American Heart Association Fellow to Faculty Transition Award (J.H.I.) and contracts N01-HC-95159 through N01-HC-95165 and N01-HC-95169 from the National Heart, Lung, and Blood Institute. We thank the participants, other investigators, and staff of MESA for valuable contributions.